I first came across friands when travelling in Australia and New Zealand. These little cakes seemed as common as muffins over there, served in coffee shops everywhere I went, and yet I had never heard of them before. Presuming them to be of French origin I thought I’d look them up when I got home, expecting to find them referred to in Elizabeth David or some such. After extensive research and unable to find any mention of them anywhere, I had to surmise that they are in fact an Australasian invention with a French sounding name. They are similar to a little French cake called a financier, made with ground nuts as the main ingredient and very little flour. This of course results in a lovely moist cake. They are easy to make, thrown together with the butter melted not creamed (what can be easier than that?) and the mixture is barely combined. The nuts and egg whites make them slightly superior to a muffin ( whilst a muffin looks up to a friand but down to a fairy cake – the fairy cake says ‘I know my place’), but the extent of their variations with different nuts and added fruits means they are just as versatile. A perfect cafe cake or a special little treat to serve up when a friend calls round for tea. They have become a bit of an obsession of mine and I have collected lots of recipes. Having said that they are a cinch to make, I am in fact starting with a recipe that calls for a fair bit of extra messing about, which isn’t usually what is required but it seems like a good opportunity to use up some more rhubarb. 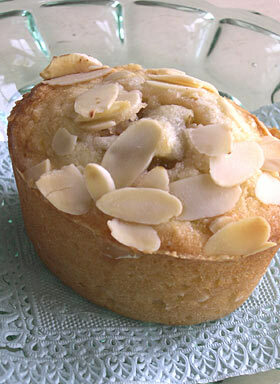 For these rhubarb friands the fruit is added to each one in the form of an frozen cube made of rhubarb puree. Subsequently you have to think ahead, making and freezing the cubes beforehand. When the cake mixture is spooned into the tins a cube of puree is popped into the centre of each one prior to baking. It is an interesting idea as it keeps the filling together in the middle of the cake. Freezing fruit puree like this is a good way of preserving fruits when there is a plentiful supply for use later out of season. If you think this is just too much faffing about, you could try putting a teaspoonful of rhubarb compote in the middle of each one and hope it doesn’t ooze out all over the place. I love giving friands to friends for the first time and watching their faces as they bite into them expecting them to taste like either a fairy cake or a muffin.Last week I made some with morello cherries and a drop of almond extract.Wonderful with raspberries and white chocolate,and with all those egg yolks you can make some ice cream to go with them.The only problem with them are the comments and laughter when you tell family and friends what you are serving them…..What the *!*? is a friand.Love this new recipe,can’t wait to try it. Now this is just the kind of Friands I love! Your tempting recipe combines several of my favourite ingredients.. Almonds and rhubarb.. can’t go wrong with those two! My rhubarb patch has been depleted of late… too much rhubarb cake consumption. Thanks for this recipe G.
I was just wondering if you can tell me where I might find a friand tin over here in the UK. I’m from Aus and I love friands, and although I guess I could make them in muffin tins, I would love to find the oval friand tins to keep them as authentic as possible. Hope you can help. Friand tins are currently avaiable from here. I found your comments on friands very interesting and am looking forward to making some. The blue printed paper friand cases are great. Can you please tell me where I can get these from? From where can friand paper cups be purchased in Australia? 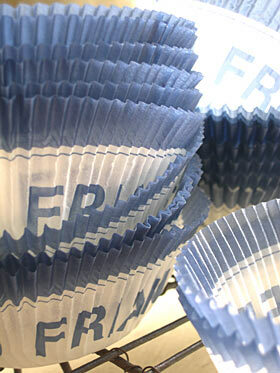 Do you know where I can buy the Friand cases in the UK?